Remember a couple of weeks ago when I was singing the praises of these beautiful smocked curtains? I knew then and there that I HAD to come up with a less expensive version of these beauties (i.e. one that didn't cost $108 per panel). And I had a plan. Then while visiting my parents the other day, my Papa dragged me to the basement to look at some of the things we stored at their house before we moved to Massachusetts. Lo and behold, in the box were a pair of curtains from the Princess' nursery. I remembered them immediately (why had I stored them away? hello?) and knew they would make the perfect smocked beauties I envisioned. They were inexpensive PB knockoffs...from Tar-jay I believe. But they were just what I needed. Slightly sheer...and they had the added bonus of having a "grid" woven right in. The plaid pattern saved me having to make measurements which was what I was dreading the most in my "smocking" plan. Now, I have a disclaimer to make. If anyone reading this blog knows how to smock, please forgive me. I just flew by the seat of my pants. I figured it would be kind of like creating in fabric, a hairstyle that I have done numerous times on the Princess. And it was. Sort of. I started out by creating a sort of "M" pleat on every other stripe. Then I simply sewed each pleat through about three times and knotted it off. I then took each of the "point" pleats of the "M" and seperated them pulling them down and over so that they met at the next horizontal row down, and the next vertical row over, and sewed them together again. I repeated that process for 6 rows. I'm not gonna lie. It was kind of a pain. The first panel took me an hour and a half. The second only took about an hour because I had it down to "science" by then. But I ADORE the results. And the cost was FREE!!! Well, I think the panels probably cost $20 for the pair 7 years ago. But...they were free today! Now, one thing to keep in mind if you try to tackle a project like this on your own is that you are going to lose the width of the panels by half. So they had to become stationary panels. They look lovely, however, over the Princess' bed with her old sheers under them. Now for some new bedding...and my Papa (a great metal-worker) is fixing up the Princess' headboard (pictured below in her previous bedroom) so that it can actually attach to the footboard...so there will definitely be more photos to come! 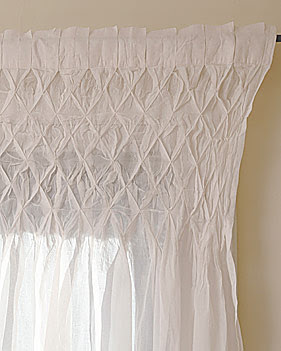 Until then....I'm loving my FREE smocked curtains!! And I have a question for my readers who may be Utah locals...does anyone have a good suggestion for a great fabric store? I don't care where it's located (as long as it's somewhere along the Wasatch Front) I just need a store with a great selection...suggestions would be appreciated. The chalkboard is finished and on the wall...post to come very soon!! Love the smocked panels. I'm not sure I'd have enough patience to do it. I have a friend who's a seamstress and she swears by this store for fabric at discount prices. It's Design Company Fabrics, Designers Resource at 196 W. 12300 S. in Draper and 2253 S 500 E. in SLC. The Draper store is the Outlet Store. I haven't been there yet, but she says it has a wide selection. Good luck! What a great idea!!! i too love the smocked curtains you have at the top of your post...yours turned out beautifully! WOW! Outstanding job! Way to make it happen. Don't you just love how some of the classic styles are coming back? You go girl for figuring it out on your own. Love them. Your really talented! I can't wait to see the chalkboard!! All I can say is W.O.W.!!!! Okay one more... I LOVE THEM!!! Beautiful job. You ladies who sew inspire me. I would have ruined those curtains! Don't you love it when you are able to transform something you already have? Home Fabrics, Silver State or Calico Corners. All in Utah. Those look amazing! How very smart to think of that. I took hand smocking classes when the girls were babies and can't remember anything I learned!! I love the 'new' smocked panels! So feminine and delicate. I will definitely store this idea away for the future. Thanks for sharing your creativity and hard work! This smocking is so beautiful. Thanks for sharing. You talented gals have such wonderful creative ideas! I like that headboard too. Wow what a great find, and how clever are you, they look fabulous. Target used to carry smocked panels and I've got one white pair. They're old and tattered now & I'm so glad for this tutorial so I can replace them w/o braking the bank! Yours turned out so pretty. What a wonderful way to make something old new again! They look lovely! Wow! I am really impressed with the end result! It is so girlie and feminine and beautiful. Love it! I've always wanted to try smocking~! Lovely! You are quite talented!! Love them! They came out just darling! I wish I knew how to smock but I haven't a clue. That's one thing I never have learned to do although I love the look sooo much!! Well done! I think they came out really pretty and so affordable. Thank you for sharing...I love the hairstyle too! I used to do something like that with my daughter. Free is always great...and you did a fabulous job on them! You did a great job! Love how they look framing the bed. So pretty. They look great! What a find. Doncha love when that stuff happens? Wendy, they look fabulous! But holy cow are you patient!!! I smocked a t-shirt once and wanted to stop after the first smock! WOW! The curtains look amazing! Great job. As a smocker... :-) You actually got pretty close. There is definitely a more direct "proper" way to do this, but you definitely achieved the effect. There are many different smocking stitches, but if anyone wants to research and see how to smock them the proper way, the stitch you are looking for is "honeycomb." You would also benefit from looking at counterchange smocking. And the way to measure things out if you don't have a plaid to help you is to draw a grid of dots onto the fabric. The curtains look great! When I lived in Utah I LOVED going to Home Fabrics on University Parkway in Orem. Cheap home decor fabric! I recovered a love seat for less than $3/yard with nice thick fabric. And also got some pretty silky fabric for less than $3 as well. I wish I could go back there!! How weird! I have BOTH of those sets of drapes that I picked up at a yard sale! Waiting for a little baby girl to come along one day. Yours are beautiful though! Oh and I'm in Idaho but if you have a HOME FABRICS anywhere near you...RUUUUN! Seriously all their cotton prints are $3/ yard and I always find some amazing things in there! I spent 2 hours just today in fact! Wow you did a great job on those! There is a pretty cute fabric store with lots of fun prints next to the blue lemon in Alpine. Not sure of the name and its quite small so it depends what you're looking for. The Fabric Store in West Jordan off redwood Road and like 90th South. They always have a huge variety of cute fabrics and ribbon that is very cheap that you can buy by the yard. Such a creative idea! Good one! these are darling and you did a fabulous job!!! I have smocked for over 25 years but I am also a rebel who never seems to do things the prescribed way!!! So I just say "Way to go , girl"
Great job Wendy! I am so impressed. I'll talk to my mom about fabric stores in Utah and let you know what she says. Unfortunately, I wasn't as into fabric when I lived there...I know...shocking :). This is a fabulous idea. I am a sewer and years ago I did this on a few of my dress designs. Thanks for bringing this idea back into the forfront of my memory. oh my goodness wendy! they look perfect! you did a great job! I saw these curtains and thought the same thing about making them! I didn't even look at the price; yep; it's WAY cheaper to make them! I can smock; smocking on dresses is not so far apart, however! You can do anything!! !Oh my goodness they turned out just perfect! brilliant!!!! These turned out just lovely. I don't know if I would have thought to try this myself. They look wonderful framing your daughter's bed. I hope you post these too. I used to go to The Fabric Center on Rewood Road and about 9200 S. in West Jordan when I lived in SLC. OH, those are so lovely, and you have me wishing so much that I had free curtains in a box somewhere!!! Home Fabrics has been good to me! And I to them, as well!! They are on 7200 South State Street, behond John's restaurant(??) and next to Saver's. Great post! These are beyond amazing! I've never seen anything so beautiful! I am going to feature this at somedaycrafts.blogspot.com. Grab my "featured" button. This will drive some traffic your way! They look fabulous!!! I LOVE the smocked look too. Great job and way to go on the savings too! $108 a panel? Insanity! Abosolutley adorable! And what a savings! Thank goodness for parents that keep everything. Wow. Woowweeee! You are amazing. You rock the smock.